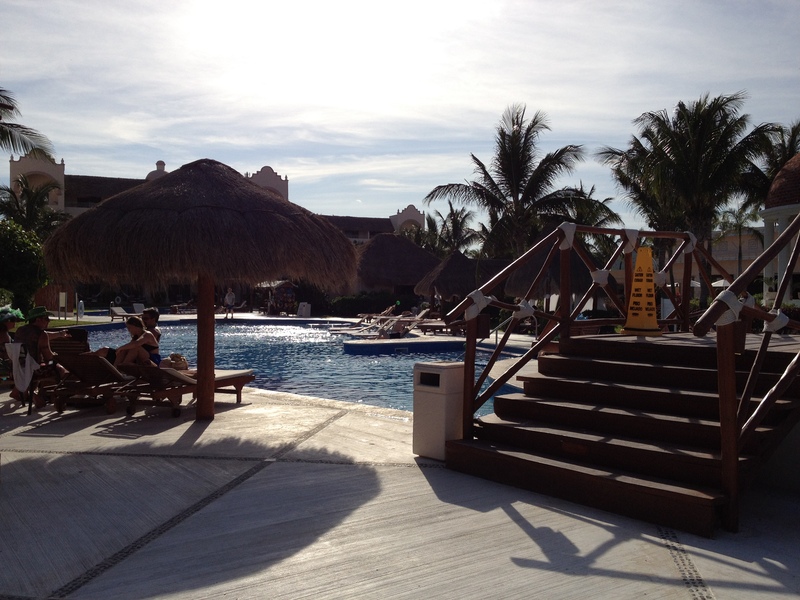 We stayed at the Excellence Riviera Cancun for 1 week in mid-March of 2012 in a wheelchair accessible swim-up room. 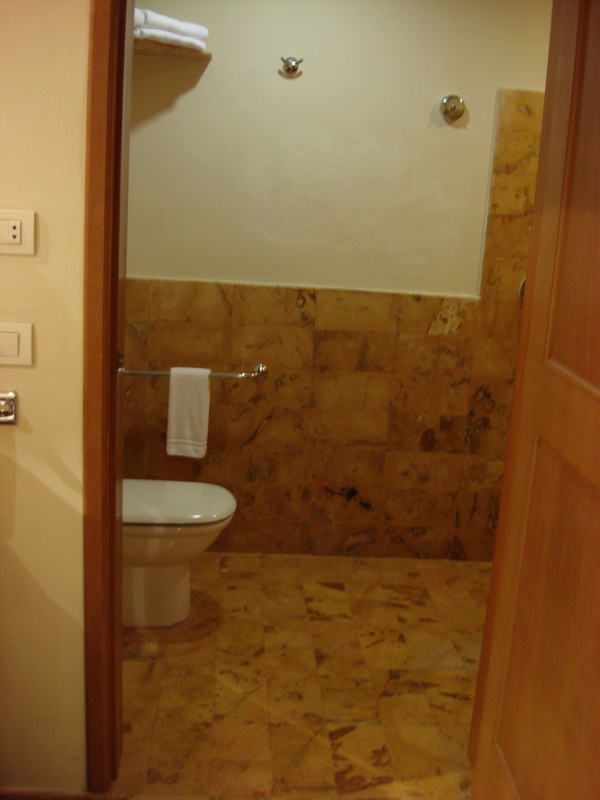 We stayed in Room 1002 in Building 1 and the swim up rooms there were very private. I feel torn writing this review because for those not in wheelchairs, this is a very beautiful resort with a lot going for it. The food was really excellent – probably better than at any resort we have stayed at in Mexico or elsewhere. I really enjoyed that they had a lot of healthier and vegetarian alternatives. The buffet was full of fresh fruit and salad and there were tons of salad toppings. There were also healthier alternatives available on the menus and they tasted very good. There was 24-hour room service with decent food and none of the restaurants required reservations. The pools were very nice, the rooms were clean and there was a (very) mini bar in our room that got stocked with water, pop, beer and a few chocolates each day. All of the staff were pleasant and willing to assist. The sand on the beach was amazing. 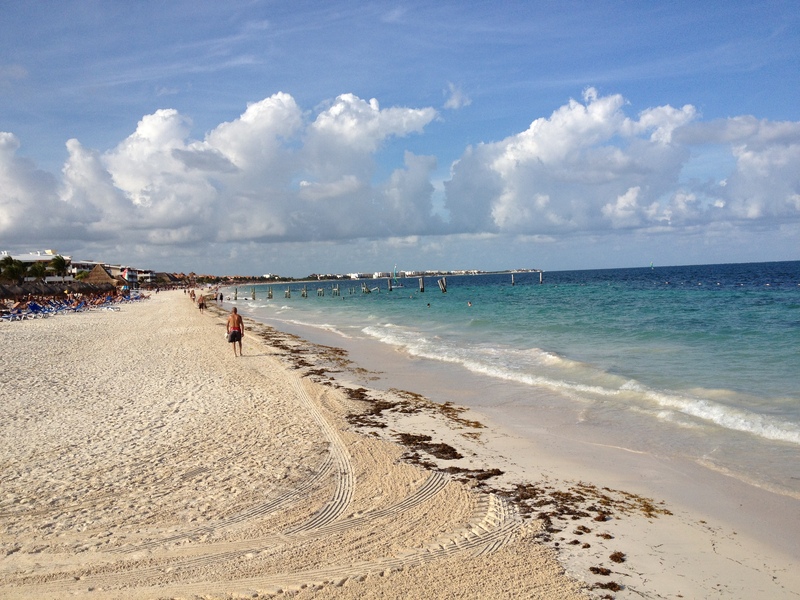 It was fine, fine white sand that a lot of people said was just like Cuba. The resort felt very safe although guests did not have to wear wrist bands and the beach was open to the public. There was entertainment every night and most afternoons and the hotel provided a sheet every day of the next day’s activities, restaurant hours, etc. There were lots of people at this resort who had stayed here before, so they must be doing something right. 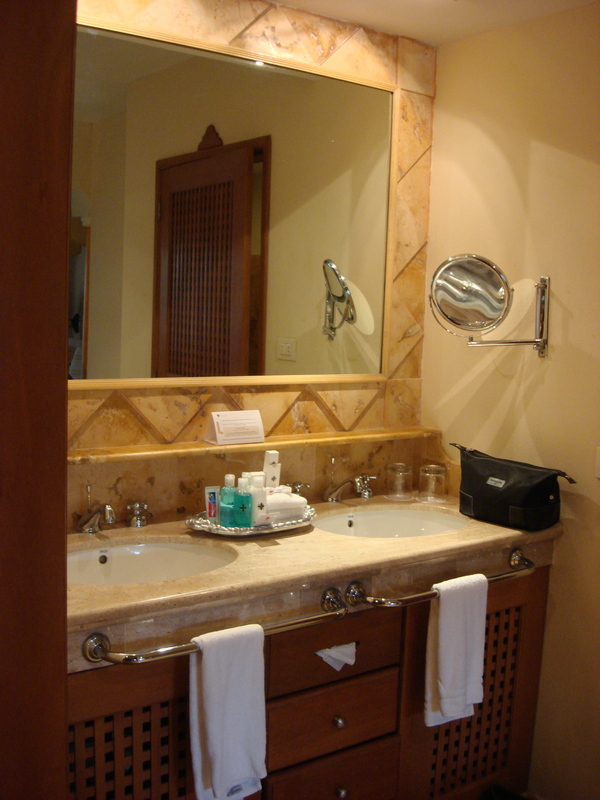 In terms of accessibility, there was an accessible bathroom outside near one of the pools and inside near the main bar. There were tennis courts you could access in a wheelchair if you were able to travel over a little bit of cobblestone. There was a big gym that you could get around in as long as you could get over a small step at the door. You could get in to the spa area in a wheelchair (although I’m not sure about the treatment rooms). The three stores/shops were accessible and all of the restaurants, other than the Basmati restaurant, were accessible. Although they do not have a pool lift, there was a ramp into one of the pools, which might be helpful if you have a chair with which you can wheel in to the water (they do not have one on-site). 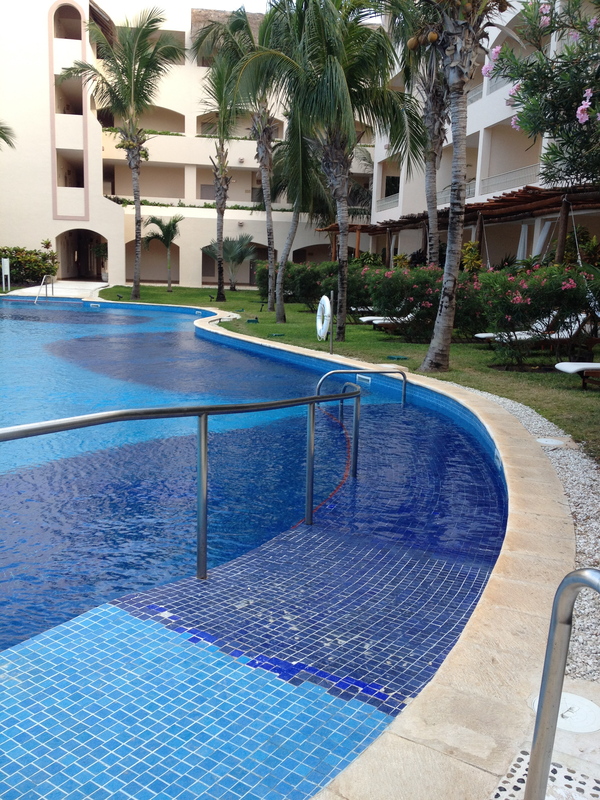 We found it was fairly easy to just bounce in to the pool near the stairs. We had a great experience doing a shopping tour of Playa del Carmen. The bus driver and tour guide carried my husband on and off the bus, which was amazing. Playa del Carmen was worth seeing, especially at night. Although some of the shops are not accessible, many are and the main road (although a bit bumpy in spots) is easy to navigate in a chair. Despite all of the good things about this resort, I would have a really hard time recommending it to anyone in a wheelchair. There was no wheel-under sink in the bathroom (which they did tell us before we got there) and the mirror above the counter was too high for someone in a wheelchair to see into. 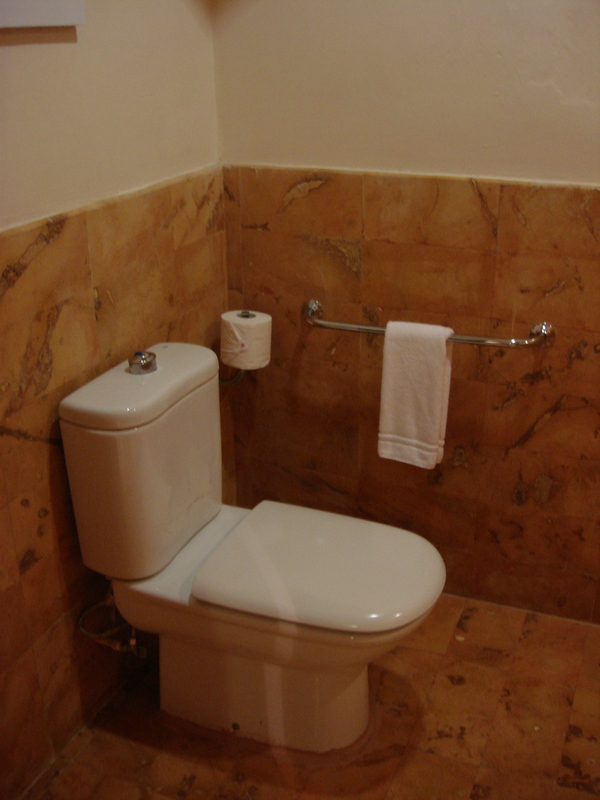 The toilet was low and was in a separate room with the shower, so there wasn’t a lot of space to maneuver a wheelchair in there. 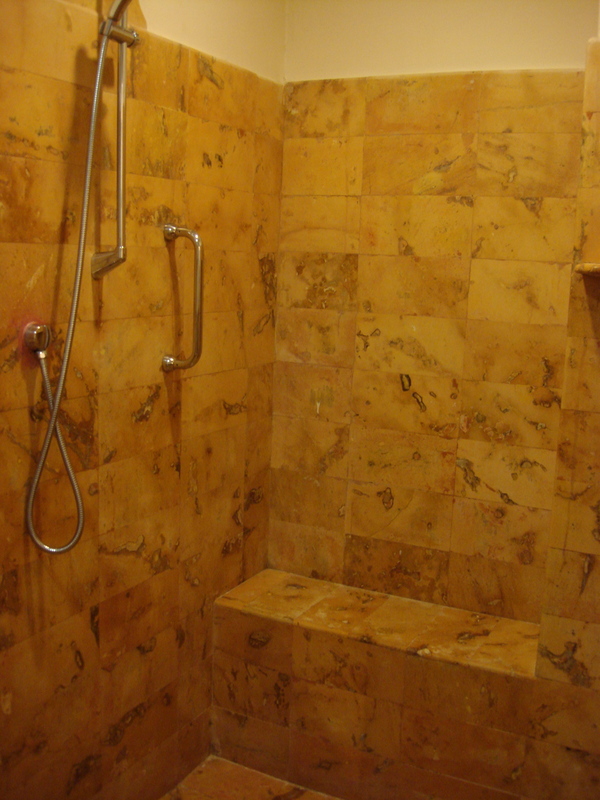 The shower had a built-in bench that was made from tile and was very small (very slippery and very difficult to stay on when wet). 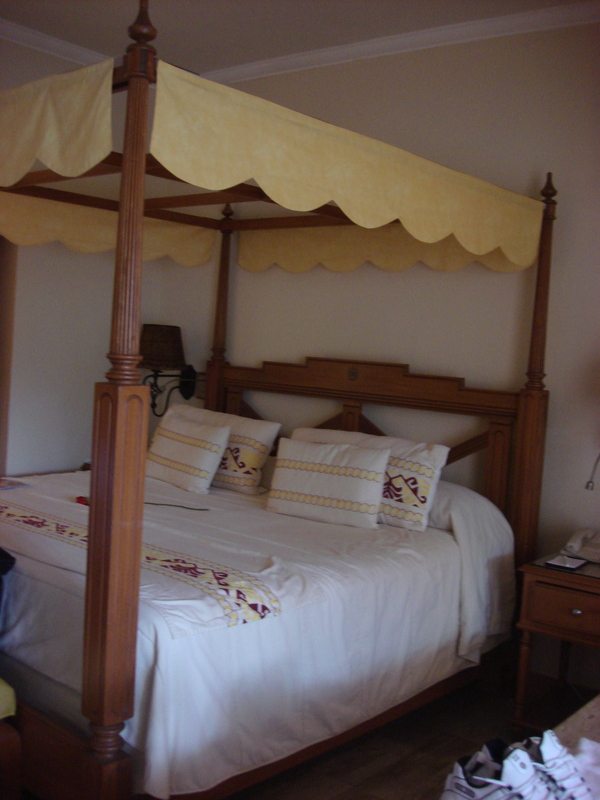 The bed was very high and difficult to get in and out of and there wasn’t much room next to the bed for a wheelchair. 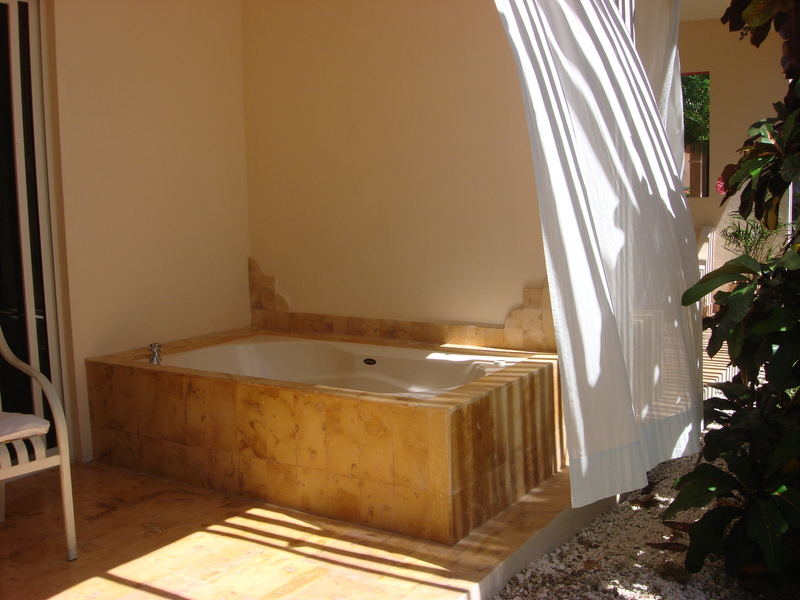 Although the jacuzzi tubs were nice, there were no grab bars near them. My husband managed to get into the tub in the room without too much trouble but we just about killed ourselves trying to get him back out. The pool area had a lot of step bridges to get from one side to the other and those in wheelchairs could not cross them. There was only one long way around the pools for those in wheelchairs, which was extremely annoying. The Basmati restaurant was not wheelchair accessible and all of the tables in the other restaurants were low and difficult to wheel under. They did not have a beach chair for going on to the sand. They did have some wooden planks that extended out on to the sand so that you could at least wheel onto the beach but it would be nice if they had a way of getting closer to the water. There were a lot of stairs at this resort but there were also three elevators that, if operable, would make it fairly easy to get around. Unfortunately, two of the three elevators were not in service while we were there and when we inquired as to when they would be fixed, we were told that they had no idea. I believe all of the wheelchair rooms are together in one building on the main floor and are all “swim-up rooms”. 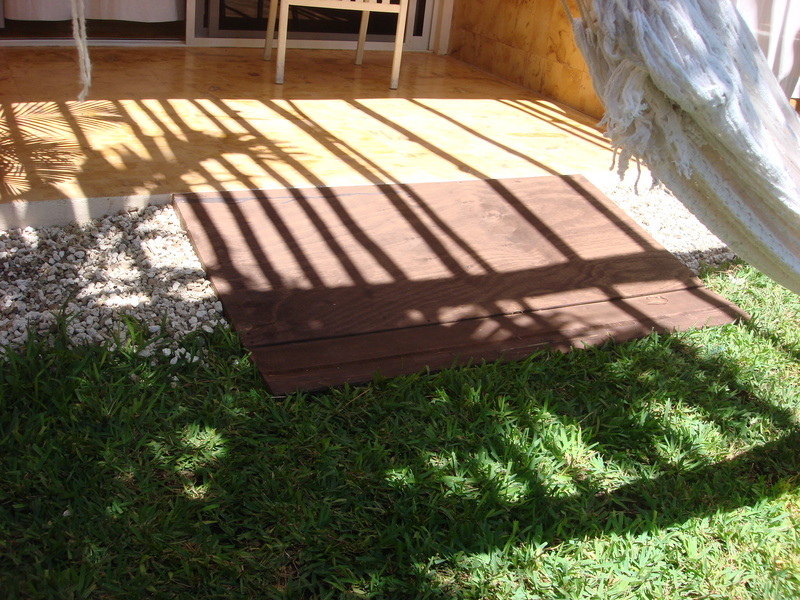 There is a step off of the deck onto some rocks and then onto grass and then about 20 feet of grass to get to the pool. My husband had a very tough time getting off of the patio and over the rocks to reach the lounge chairs, so the maintenance staff installed a small ramp to help him get over the rocks. 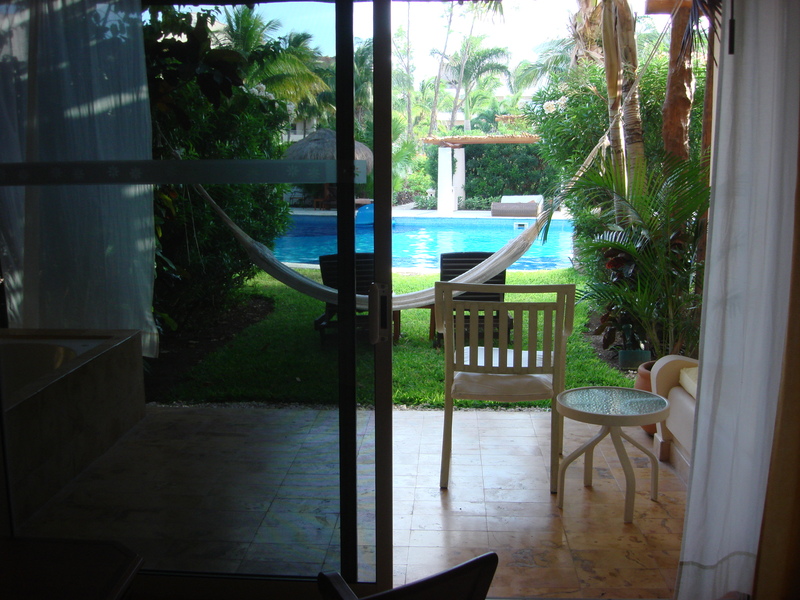 In a chair, you would have a tough time getting in and out of the pool in front of your swim-up room. There are no platforms in the pool and no stairs on that side of the pool to bounce down on. If you call the hotel in advance of your trip, they will tell you that it is fully wheelchair accessible, but this is not the case. We spoke with a few other people at the resort in wheelchairs who were also struggling with the lack of accessibility. 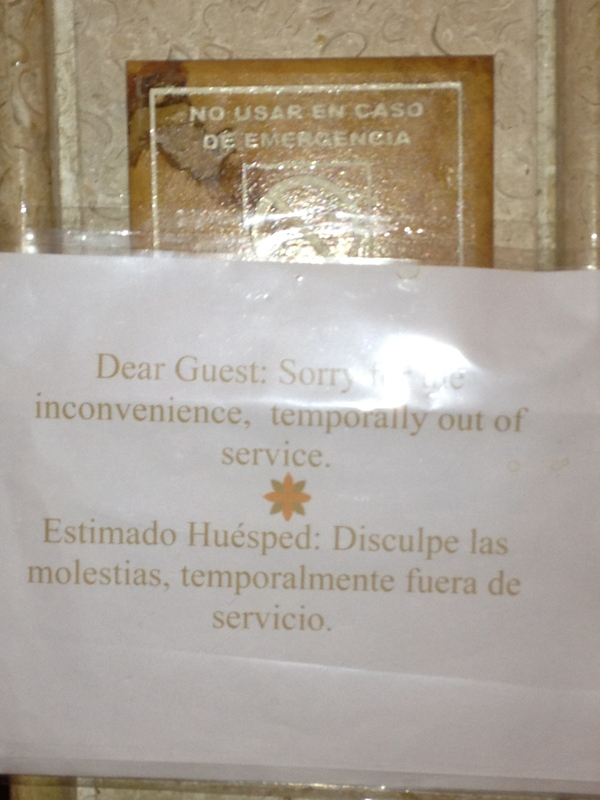 In terms of overall negatives, the resort felt understaffed. We often sat outside of our swim-up room or by the pool for 2 or 3 hours without anyone coming by to ask us if we wanted something to drink. This may have been because we chose the quieter pools to sit in, but still… The service in the restaurants, in general, wasn’t great. They were often slow to clear plates and it felt like there was only a couple of people serving large sections. We often had to ask for more water, more buns or had to wait quite a while for someone to come and take our order. There was one morning where we had the do-not-disturb sign on our door and someone from the front desk called us to tell us something because they didn’t want to knock. There was another morning when a staff member knocked on our balcony door when we were sleeping to tell us about some work they were doing outside. These are things that definitely wouldn’t happen at most resorts. The other guests hoarded these blue pool floaties even when they weren’t using them and it was frustrating trying to find one that wasn’t spoken for. Also, people left towels and other belongings on chairs and sun beds all day long and it made it difficult to find places to sit in the shade. 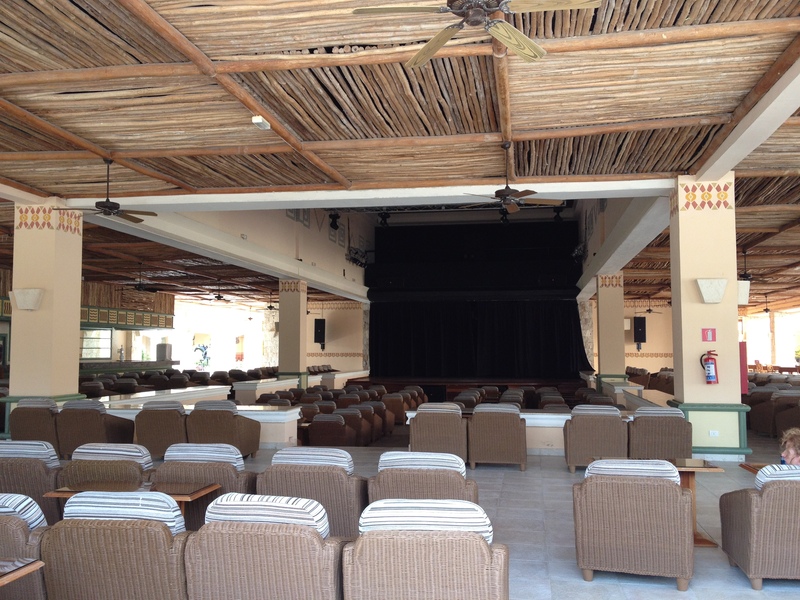 We often struggled to find a place to sit and then watched the chairs next to us remain empty with towels on them all day. They have a great concept with the “X-box” which is a small closet in your room that can be accessed from the hall where you leave your dirty dishes after you order room service. The idea is that you don’t have to open your door to place the dishes out in the hall and the hallways don’t end up cluttered with dirty dishes and half-eaten food. The dishes in our X-Box piled up over several days, however, and we finally had to call and ask someone to come and take the dishes as they were smelling up our room! Overall, if you are able-bodied, I think you will really enjoy this resort. 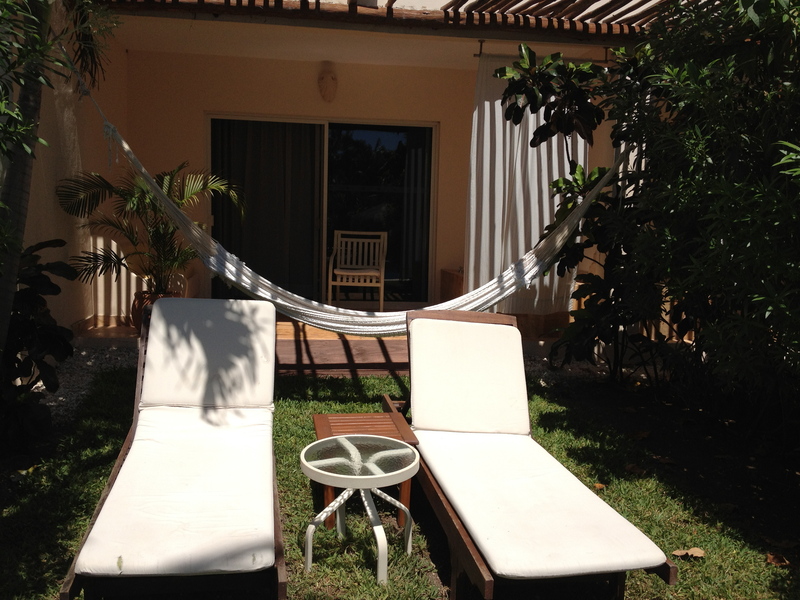 It is an adults-only resort with a beautiful beach, great food and a quiet, relaxed atmosphere. If you are in a wheelchair, I would phone around and find something better for wheelchair access. Even with all of the good things this resort has going for it, the accessibility issues are so significant that they will seriously detract from your ability to relax and enjoy yourself. Travel Tip: The roundtrip transfers that come with your vacation package (if you book a package) are not accessible. We complained to the resort that it was discriminatory to offer transportation that was not accessible and they offered us complimentary transportation with Cancun Accessible. They picked us up in a van at the airport and took us to the resort and picked us up at the end of our stay and took us back to the airport. They were efficient, had lots of room for the chair and all of our luggage and travelling with them made our transfers pretty easy and stress free. Their website is: www.cancunaccessible.com. 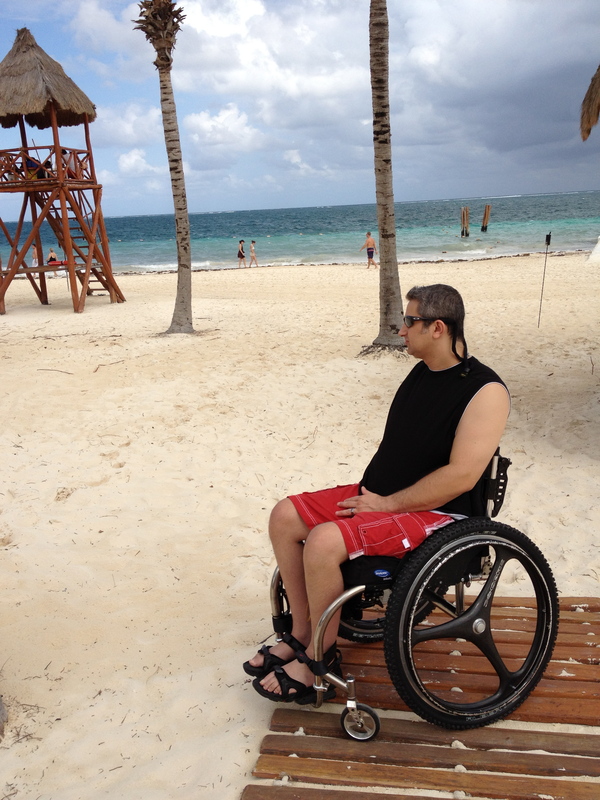 This entry was posted in Mexico, Puerto Morelos and tagged accessibility, accessible, all-inclusive, beach, Cancun, Excellence Riviera Cancun, grab bars, manual wheelchair, Mexico, paralysis, paraplegic, Puerto Morelos, ramp, special needs, spinal cord injury, swim-up room, travel, vacation, wheel-in shower, wheelchair, white sand by papawheelieblog. Bookmark the permalink.